Malnutrition occurs when a person's diet and/or dietary supplements fail to provide the nutrients necessary for health, growth and normal body function. Malnutrition can affect every system in the body, depending upon the cause of the malnutrition. In mild to moderate cases of malnutrition, no symptoms or signs may be evident; however, as the condition persists, the signs and symptoms will become more pronounced. The most common symptoms of malnutrition include significant weight loss, fatigue and dizziness. These can become apparent at any point after the lack of nutrients is realized by the body. When weight loss is the only symptom, doctors sometimes make a diagnosis based on the body mass index (BMI) of the patient, which takes into account age, gender, height and weight. Swollen and/or bleeding gums are the first oral symptoms of malnutrition. As the malnutrition continues, the teeth may begin to decay. When only the gums are affected, the oral effects of malnutrition can be reversed; however, once the teeth begin to decay, the damage is permanent. Fragile bones, osteoporosis and muscle loss and/or weakness are symptoms of malnutrition. When calcium or vitamin D are the nutrients lacking, these symptoms may manifest shortly after the body becomes malnourished. Malnutrition can cause a slowed reaction time. However, in the elderly population, malnutrition may cause dementia and/or memory loss. As malnutrition ravages the body, the organs may begin to function less efficiently. This can lead to heart problems, decreased liver function, kidney failure, decreased lung capacity, intestinal problems, stomach irregularities and abnormal menstrual cycles in females. Ascites, which manifests as a swollen or bloated abdomen, is a sign of malnutrition. This condition is exacerbated when the liver, kidneys or intestinal tract is affected. 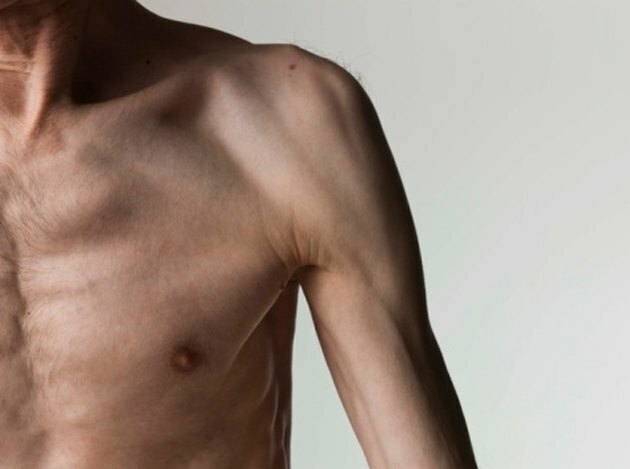 People with malnutrition may develop abnormally dry skin, despite the use of lotions and creams. In severe cases, the skin may begin to crack.